Samson specifically offer a vast selection of aluminium and steel security roller shutters designed for effective use as bar, kiosk, serving and reception desk physical protection. Whether one of our bar & kiosk roller shutters are used to protect valuable goods or simply to close off an area after hours, we ensure to provide the highest levels of security needed along with ease of use and the highest of quality in operational design and finish. 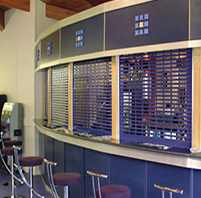 Each security bar shutter is designed mainly for use in low and medium risk internal areas. This means they are often not as strong as external security shutters and therefore can be obtained at a lower price. Some shutter types provide a choice between having a totally solid curtain or a high vision curtain which allowed light through the shutter. This is through perforated or punched vision slats for visibility. This allows for better airflow, products to still be advertised while being safe and allowing light into the room without losing any visual appearance. 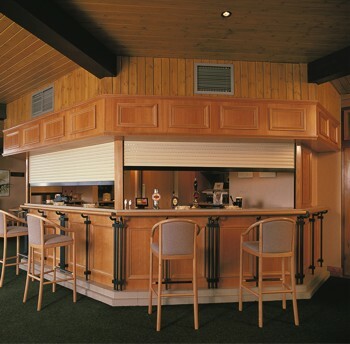 These shutters are not only used on bar serving areas and reception kiosks, these shutters can also be installed on servery hatches, catering trailers, service counters, display areas, secure cupboareds, shops and more. Requiring little space to support the structure of a secrutiy roller shutter, needing two guide rails and a shutterbox above the specified area. Samson Doors keeps things out of the way for busy worktops and areas needing to use all of the space during working use. 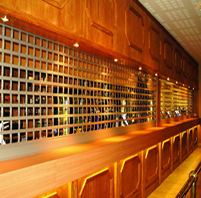 Security shutters for bars and serving counters are usually required to be fairly wide and yet have the smallest possible curtain roll to maximise the space above a bar area for the shortage of glasses and bottles. This is easily achived with the SeceuroShield and SeceuroVision range of shutters. The basic foam filled aluminium SeceuroShield 150 shutter offers low security and minimal colour choice but still provides a good solution in premises where appearances are important such as in hotels and restaurants. For high security requirements, the SeceuroShield 38 and SeceuroVision 900 models are the ideal choice. With solid perforated or punched options and a glazed curtain roll to ensure strangth and still offer good visibility, the SeceuroShield 38 is one of the best all round security shutters as it achieves high security with a very strong extruded double skinned slat and also has a small depth to each slat, enabling a smaller roll sized and therefore more usable in situations where space above a counter may be limited. This is usually the case in bar and serving areas, we cover the whole of London area for security shutters and have surveyed and installed services for London and the rest of the country. The image to the right shows all the specific basic measurements used when referring to a security roller shutter for almost any purpose. The roller shutter security layout is the same for almost any model where there is always a roll at the top which is the curtain rolled up so will vary in size depending on the height and the thickness of the curtain lath used. The side guides are available im any different widths and depths to offer high levels of security as well as extra resistance to high winds in exposed areas, although not normally encountered inside of course this does offer greater resistance to a forced attack. 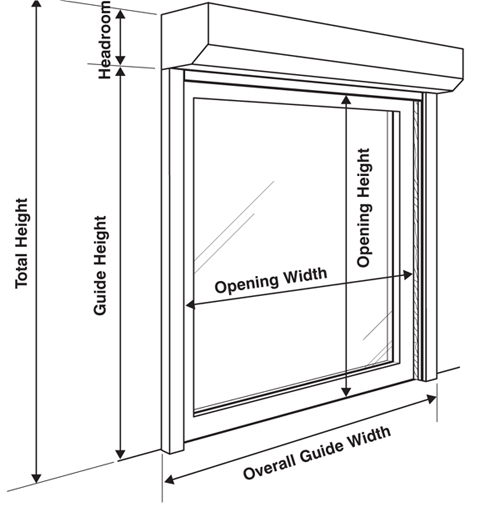 These variations in the hood and endplate size and the guide width obviously effect the overall width and height so be careful what measurements you are referring to when specifiying a roller shutter. They can obviously be installed outside, inbetween or inside an opening and these sizes will all be relevant to ensuring the best installation. Operation for almost every shutter can be manual or electric and there are many variations in the methods of locking and control. For multi shutter applications some thought must be given to how each shutter is to be controlled if they are electric and to open and close multiple shutters is possible or one by one depending on locations and building layout. 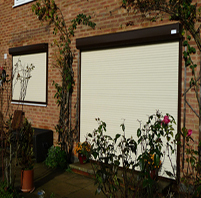 Security roller shutters of any kind can be either spring assisted, rod and crank operated or pulley operated in manual format or the ever increasingly popular electric barrel motor operated for ease and convenience. The motor operation is a very well priced option nowadays for most applications and reliability is not an issue. The motor drive units are inside the barrel so completely hidden with the only requirement being a power source. The control is ever increasingly using complete wireless technology meaning much faster installation times and complete flexibility on the access control methods used. The standard wall mounted internal switch may well still be the most popular method for commercial use but for the home the choices are endless including control using your mobile smart phone or Ipad. The handing when referring to the side for operation for say the crank handle or the side which the motor is fitted and therefore has the power cable and also the manual override is ALWAYS taken from the NON HOOD COVER side - i.e. the side of the security shutter which shows the flat fascia panel. If you were installing the security shutter to the outside face of an opening then this would mean the handing is taken from looking inside the building outwards. Call us now for a discussion on the options available for security shutters and the very best prices on the highest quality products currently available in the UK. We can supply the shutters for your own installation or provide a full installation service for you or your customer. We offer a consulation service once approximate pricing has been established and agreed. You can send in images of the windows or doors, approximate measurements and we can return with suggestions and pricing options. These are required on larger shutters and are optional on smaller shutters. Tubular motors fit inside the axle and require a 3 amp fuse. Standard operation is by rocker switch, key switch or remote control. For external operation on exit doors, shutters can be spring loaded with a transverse key lock in the bottom slat. A popular option for bar, servery, counter, cabinet and kiosk applications. Shutters are raised and lowered from inside by a geared rod crank winding handle which hangs down vertically underneath the box and secures on a clip when not in use. Depending upon shutter size the belt is operated manually or by geared crank handle. This is a low security option. Shutters are raised and lowered from inside by a belt.